1)	Tell your friends about the Second Amendment Book Bomb and urge them to take the pledge as well. 2)	In addition to buying a copy for yourself, consider buying additional copies for family members, friends, associates at work, community leaders, schools, libraries, journalists, policymakers, and others to use in order to spread the ideas of the Second Amendment. Our goal is to reach one million Americans with Dr. Halbrook’s milestone book. 3)	Put SecondAmendment.com in your email signature and/or the signature you use in online forums. 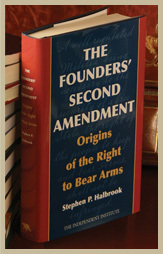 4)	Tell your local gun club and other groups about SecondAmendmentBook.com. 5)	Blog about it or post it on your social networking sites (Digg, Facebook, MySpace, Twitter, Del.icio.us, Reddit, etc. ).